Avatar Space Design P/L in cooperation with Floriade Festival, 2003. An abandoned outpost on a distant planet has the human cast–a–ways living in faint hope of ever returning to earth. 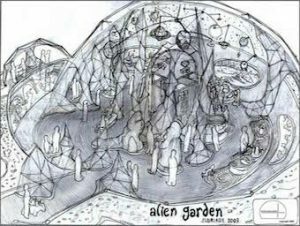 Cocooned in their protective dome,they peer into an alien universe whilst assembling whatever relics they have managed to find into a garden of earthly memories. A gravel pathway leads to a cluster of canopied 5/8th geodesic spheres (the dome cluster) encircled by a one–metre–wide flowerbed. Inside, images of virtual plants– from massed flowers to cellular structures- are projected onto screens, including a large overhead circular screen suspended from the centre of the dome. The voiced Latin names of virtual cultivars are heard to cross-fertilise. Triggered by sensors, they grow and adapt to the changing environment, moving like vocal shadows in reaction to individual people and movements within the space. Alien Garden is a technically sophisticated and dynamic digital arts project, featuring a stand-alone portable 3D sound and image installation linked to a dynamic website which enables visitors and potential visitors to "seed" the virtual garden. 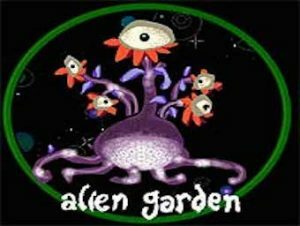 Alien Garden is being designed and made by a small group of Canberra’s most experienced digital artists. It will initially presented as a month-long installation at Floriade’s 2003 festival (audience of approximately 340,000 people), but has the potential to be toured extensively both within Australia and internationally. There is a clear reactive relationship between the evolving projected images, the vocalised plant names, the 3D musical tendrils of plant sub–structures and the movement and overall number of visitors and visitor flow. The sounds and images themselves grow and evolve in accordance with "seeding" structures supplied via a website. This website is also available on site and it enables visitors and intending visitors to contribute to creating the plant and flower structures and growth rules for this virtual evolving garden. This "genetic" material is continually being loaded into the dome’s real-time sound and image synthesisers, which grow, evolve, cross-fertilise and sometimes mutate. The website seedlings can be password protected by their creators, and on arrival at the dome, released into the virtual garden, a technique that will permit strong audience identification and participation. We intend using Lindenmeyer Systems as the basis for the structuring of sounds and images for this project. Lindenmeyer Systems (L-Systems) provide a powerful method for creating complex sound or image structures from simple materials. L-Systems have traditionally been used to model natural objects such as plants and cellular structures, although they can be used to create a wide variety of structures and transformations for music and visual compositions. L-Systems work on the principle of data-base amplification which allows complex structures to be generated by the repeated application of rules on an initial axiom or premise, just as a complex biological organism's DNA controls it's growth and development. We have prepared a tutorial covering the basic notions related to L-systems which allows the reader to develop an understanding of the theory using Turtle geometry (Prusinkiewicz 1986). A subset of this material will be adapted for a general audience as an educational and informational addition to the proposed website for the work. Collaboration with Canberra Tourism and Events Corporation (CTEC) Floriade festival offers the opportunity to present the work as a continuous installation over a period of one month to a wide demographic audience. A potential 340,000 people will witness the new sound space. Floriade has also offer their full support with marketing and promotion and the project will be highlighted as 'a significant new activity in the Floriade program'. • Determine logistics and strategies for the work. • Research the material needed for the content. • Mapping of the programming environment. • Produce and develop content. • Finalise the venue details with Floriade. • Configure the dome for trial. • Fine tune the work and organise presentation logistics. • Final trial of work. • Construct the work on site. • Maintain the work during the festival. • Maintain the work on site, education activities. • Demount and write reports, acquittal etc. This project will prove to a large audience that the ACT is a region of excellence and innovation in the digital arts. The connection with Floriade will ensure that most people in Canberra will be aware of our project. In addition our web skills and online presence will be utilised to seek national and international exposure. The Fertile Garden of Virtual Cultivars will be an exploration of a theme that is specific to the venue and will therefore be of intrinsic interest to the potential audience. It will encourage a participation and input both through the web and via movement within the space. The creation of virtual plants will be in the hands of the participant and will therefore be educational and enjoyable for both children and adults. It is the immersive quality of sound that will make the work intimate and memorable, bringing forward the aesthetic potential of the digital arts- an aspect so often ignored when dealing with technology. In short, the aim is to make the work accessible and relevant to the majority of the public.